Drunk and on his way home, Mr. Doolittle stumbles upon a Chinese man who asks for directions. The man, Mr. U, explains he is not from the present (1926) but from 9th century China. He has come here because someone had disturbed his grave and taken his idols, thus rousing his spirit to come to New York. Mr. Doolittle and Mr. U make their way through New York to the address of the man who stole his grave mementos. As they get closer, Mr. U convinces Mr. Doolittle to shout a Chinese curse that will have his servants (who are also ghosts) respond from inside the dwelling. Upon doing this, there is commotion in the house and Mr. U thanks Mr. Doolittle and then explains that he must rush back to his body in order. He leaves Mr. Doolittle with a bag as his reward. Mr. Doolittle returns to his room and when he awakes the next morning, and finds in the newspaper that the artifacts of Willy Judesheim (the man who stole from Mr. U's grave) were completely shattered. When Mr. Doolittle opens the bag that he was given by Mr. U, it is filled with golden confetti which is used at Chinese funerals. This was the quirkiest of the stories thus far in this anthology. 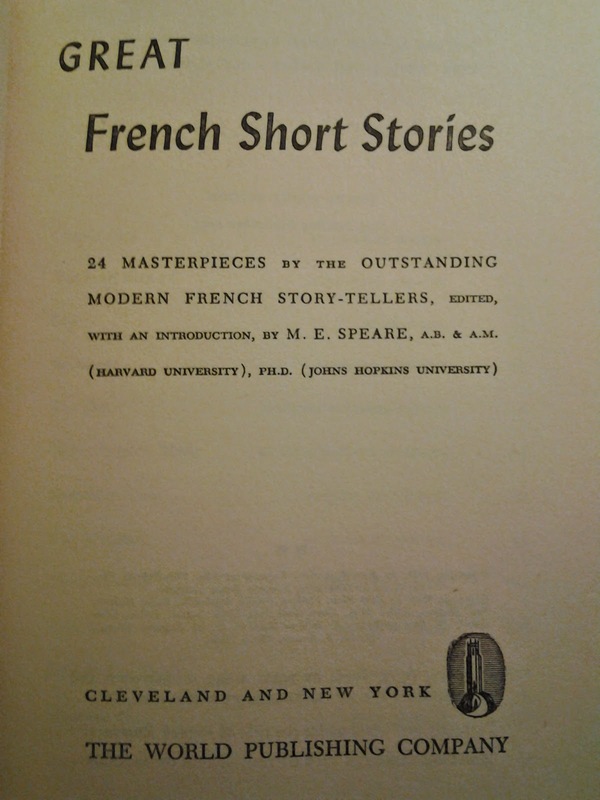 Love and madness seem pretty straightforward in this collection of French short stories, but this seemed to come from another direction. It's a curious story and yet, it has dapplings of racial or ethnic stereoptying all over it, from the Irish, Mr. Doolittle and his only interest in politics to the Chinese man and what he utters, to the the thief/hoarder, Wily Judesheim.